On our trip to Cuba, Gio and I fell in love with Cuban Dicharachos. Dichos for short, are colloquial expressions used to describe common day-to-day occurrences. These spicy expressions are colorful examples of how Cubans approach life with humor and inventiveness. Everywhere we would go, we would hear them and jot them down to later ask a family member. We left Cuba with a book full (see attached photo) of dichos that Gio wanted to personally archive, organize, and share with the rest of the world. 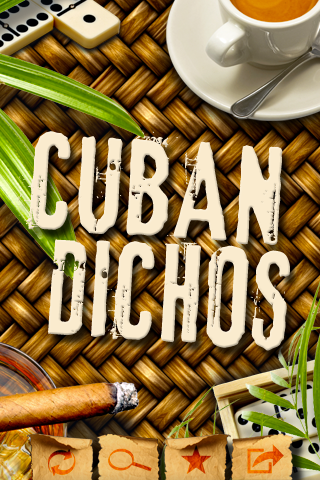 His vehicle: an iPhone/iPod/iPad app (perfectly appropriate for the geeks that we are) called simply enough â€œCuban Dichosâ€œ. This app is the #1 Cuban App now on iTunes and I canâ€™t tell you how many e-mails I get filled with dichos I didnâ€™t have, including some new ones from the younger reggaeton generation in Cuba (ex: Hasta cuando son los 15 de Jacqueline? ).